My care-free summer attitude has turned into a calmed soul, wanting comfort. From what? Maybe the cold, maybe the insanely chaotic holiday season at Whole Foods? Either way, I am in the mood for comfort food. Luckily, mother nature knows us so well that she gives us the perfect vegetables for comfort food in the winter. First on the orange, wintery, comfort food list? Sweet potatoes. 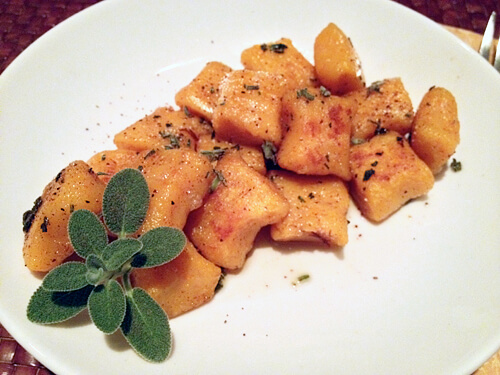 Specifically this sweet potato gnocchi-drenched in rich browned butter. This recipe is not for people getting ready for their beach vacation. This is for those who know they will be in baggy hoodies and winter coats for the next 7 months. There is something about sage that pairs so well with winter vegetables; lucky for me, my sage plant outlived most of my other herbs. The key to fluffy gnocchi is making sure that you don’t over-work the dough. I ended up adding a substantial amount of extra flour to mine to make it less sticky and it seemed to turn out light still. I found this recipe on Yummly originally, but it is from Epicurious. Pierce the sweet potato all over with a fork, then microwave until soft (about 5 minutes per side). Cut in half, cool, then scrape out the flesh into a medium bowl and mash. Transfer about 1½ cups to a large bowl. Add the ricotta and mix until evenly combined. Add the ½ C parmesan, 1 T brown sugar, ½ t nutmeg and mash until evenly mixed. Mix in the flour, a little at a time, until a soft dough forms. If the dough seems too sticky, add a little more flour. Keep in mind that the dough is going to be put onto a floured counter as well. Transfer the dough to a floured surface and knead only a few times until a ball is formed. Divide the dough into 3 equal pieces and roll into a long rope (about 1 inch diameter). Cut each rope into 1 inch pieces, then roll each piece over a fork to indent. 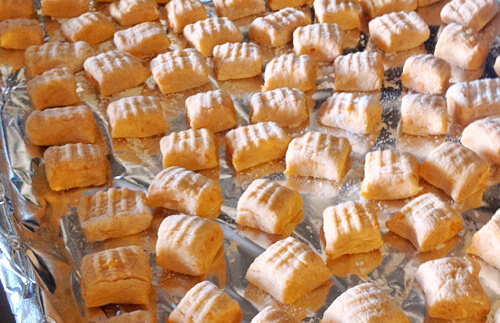 Place the gnocchi's onto a floured baking sheet. Bring a large pot of salted water to a boil. Cook the gnocchi in batches until tender (about 5-6 minutes). When ready to serve, melt 1 stick of butter in a large saucepan over medium-high heat. Cook until the butter has browned, about 5 minutes. Be sure to swirl the butter occasionally to prevent it from burning. When the butter has browned, add the sage and remove from heat. The mixture will bubble up, that's OK! Season to taste with 1 T brown sugar, salt and pepper. Add half of the sage butter to a large skillet and sauté half of the gnocchi over medium-high heat, about 5 minutes. Set cooked gnocchi aside, keeping warm, and repeat with the second batch. 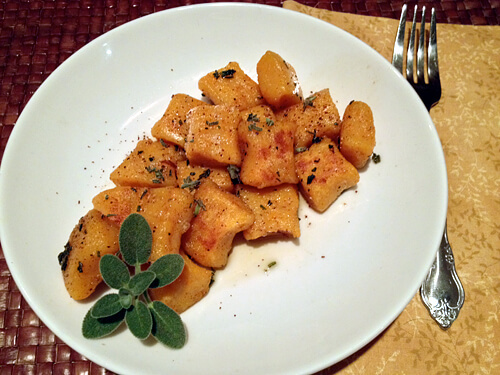 To serve, place gnocchi in bowls and top with sage brown butter. Garnish with additional sage and nutmeg if desired.